The applications for the 1st National Contest of Tactile Books are now open! This is the Brazilian stage of the Typhlo&Tactus award, a non-profit action that has been organized for 17 years by the French charity institution Les Doigts qui Rêvent. 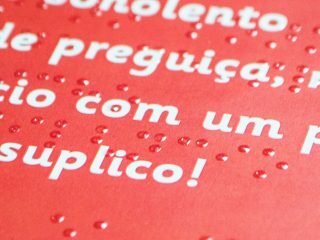 Its goal is to stimulate the creation and the diffusion of accessible books designed for visually impaired kids. Today, the contest is organized in 21 countries and the Instituto Benjamin Constant (IBC) will be in charge of conducting the Brazilian stage. Therefore, the staff of the IBC, service providers, and second-degree relatives cannot apply. The top five contestants will be granted a Finalist Certificate of the European Contest and they will be analysed by an international panel, gathered in Dijon, France. The first place will receive a trophy and a prize of 1.000€. The deadline to submit the form (first stage) is from December, 07 to January, 07. The applications are free of charge. To find out more about the terms and conditions, please refer to the competition notice and the international website of the award.